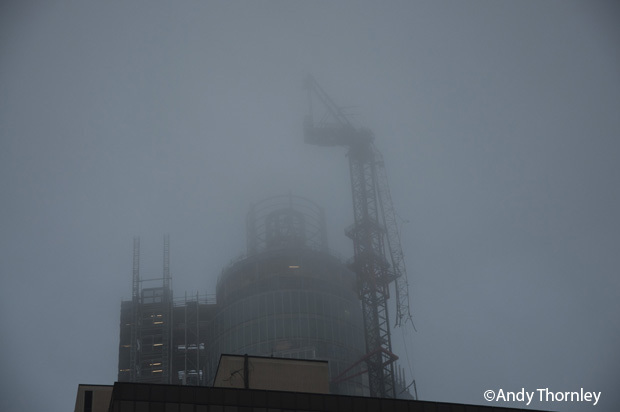 The low cloud briefly lifts to give a better view of the damage caused by the crane. A fireman on a crane looks on the smouldering wreckage of the helicopter. The building it landed next to is also damaged by fire. Heli-medics arrive by car on Wandsworth Road to treat casualties. Emergency services arrive oin the scene. Low cloud obscures the crane, however the damage can still clearly be seen. A helicopter has crashed in Vauxhall after striking a crane. Two people were killed and nine injured in the accident, which happened at 8am this morning. 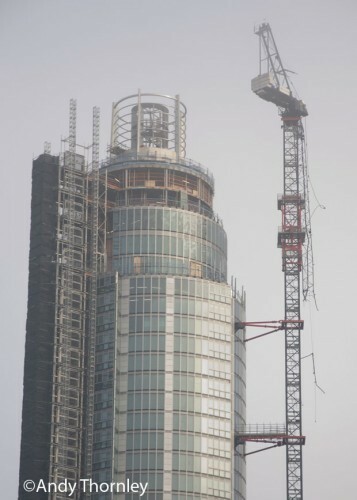 The helicopter collided with a crane attached to the under-construction The Tower, One St George Wharf — one of London's tallest residential buildings. The photographs above were taken by Londonist writer Andy Thornley. Further images and resources are linked to below. Reports from BBC, Sky News, Guardian. Update: 11am: According to the Metropolitan Police, there are eleven casualties: two people were killed, four have been taken to hospital (with one in critical condition) and five were treated for injuries at the scene. Additionally, four people were treated for shock. Met chief Bernard Hogan-Howe also confirmed that the helicopter had been diverted to nearby Battersea helipad, which was not its original destination. The helipad is currently closed, but Vauxhall station has re-opened. Here are some photographs of the aftermath from the BBC. Update: 9.49am: Most news services are agreed that at least two people have been killed. Update: 9.00am: Vauxhall mainline station and Tube station are closed, the bus station is also closed and surrounding roads are heavily affected. Update: 8.54am: Photos show that the crane was attached to the new St George's Wharf Tower. The crane is badly damaged and partially collapsed. The top of the tower is obscured by fog. London Fire Brigade describes the crane as "in a precarious position". Eyewitnesses say the helicopter was an Augusta 109. Update: 8.46am: Here's the exact spot on Google Maps. 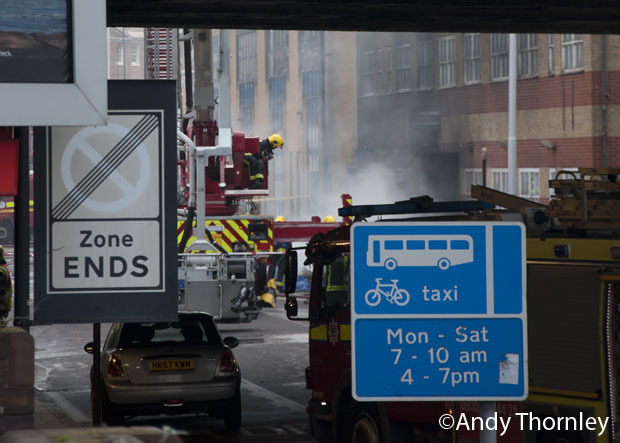 Update 8.35am: Photo shows flames on Wandsworth Road, with dozens of emergency workers on the scene. Here's a closer shot. 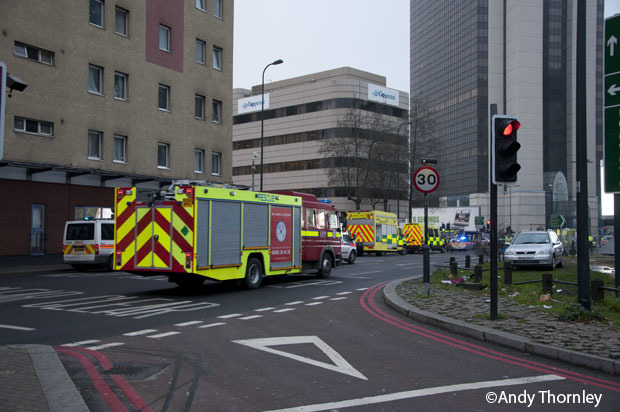 Initial post: Reports are coming in of a helicopter crash in Vauxhall. Witnesses say the vehicle hit a crane before crashing into the ground. 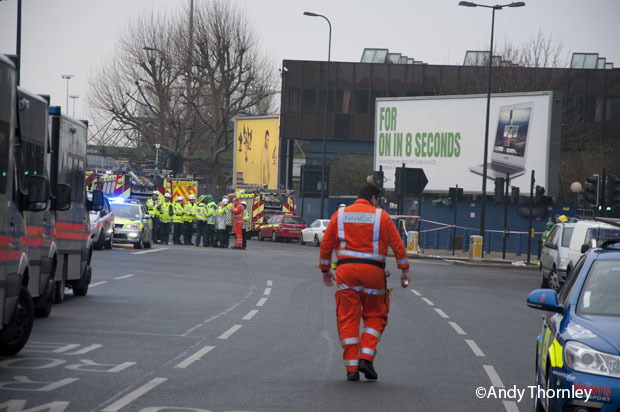 Two cars were also caught in the accident, according to the London Fire Brigade.